Flour is fine powder made from cereals or other starchy food sources. In India, flour production is predominantly in the small scale industry (unorganized sector) and milling is accomplished by grinding grain between stones and a steel wheel. The use of the "Agra" (80% silica content) and the buff stone (81% silica) for grinding and regular chiseling by the workers in order to maintain the rough texture of the surface leads to silica dust exposure [Figure 1]. In India, silicosis has been made a notifiable disease under the Factories Act 1948 and Mines act 1952. Few case reports in the past have referred to silicosis in flourmill workers in India. However, its association with flour mill workers has not yet been established. Hence, a prospective study was undertaken to study the incidence of silicosis in flourmill workers. The aim was to determine incidence of silicosis in flourmill workers and to study respiratory morbidity in flourmill workers. The study was conducted as a part of Indian council of medical research (ICMR) short-term research studentship wherein a medical student and the medical social worker from the department of chest medicine and Environment pollution research center of a tertiary care hospital informed the flourmill workers in the community regarding the purpose of this study. Following this, the workers who volunteered to be a part of the study were included. The study was conducted at the department of chest medicine and Environmental pollution research center of a tertiary care hospital. Approval of the institutional ethics committee for research on human subjects was obtained prior to the study and written informed consent of the participants was obtained. Individuals who have worked in a flour mill using silica containing grinding stones for more than 5 years and consenting to participate in the study were included. A total of 56 Indian male flourmill workers who fulfilled our inclusion criteria agreed to be a part of the study. Detailed clinical history and physical examination with detailed occupational history was obtained by the faculty of the chest department that included specific details regarding symptomatology, daily working hours at the mill, number of years at the mill, type of grinding stone used, frequency of chiseling of the stone, smoking history, and history of pulmonary tuberculosis. Laboratory parameters evaluated include hemoglobin estimation, complete blood count, and erythrocyte sedimentation rates. Sputum was examined for acid-fast bacilli. All subjects underwent chest radiograph, high resolution CT of the chest and pulmonary function tests that included spirometry and diffusion studies. Radiological images were interpreted by the radiologist assigned to the study. Chest X-ray was interpreted as per ILO classification. 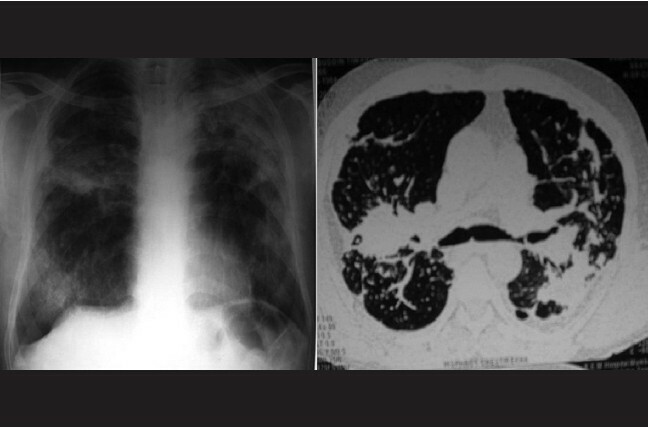 Silicosis was labeled on the basis of radiological diagnosis confirmed on HRCT. Spirometry and DLCO was interpreted by a chest physician. Data analysis was done with the help of the statistical package for social sciences software. The Chi-square test was used for determining the relationship between qualitative data and descriptive statistics was used where required. 56 Indian male flourmill workers between 22 and 75 years of age were studied (mean age 42.25 years; SD 13.17). Duration of occupational exposure at the mill ranged between 6 and 45 years. 42/56 (75%) had more than 10 years of exposure at workplace. The workers spent 4-12 h a day at the mill with 23 (41.1%) working for 10 h a day or more. The total duration of exposure was calculated as number of hours worked per day multiplied by number of years [Table 1]. The stones used for grinding were Agra stone (red sandstone) in 53/56 (94.6%) cases and buff stone in 3 cases. The workers chiseled the stones for 2 to 5 h at regular intervals, the frequency of chiseling varying between 1 and 7 times/week. Of the 56 only 1 worker used cotton cloth over the nose for protection while 55 did not use any form of protection. 52/56 (92.8%) of the workers had respiratory complaints. 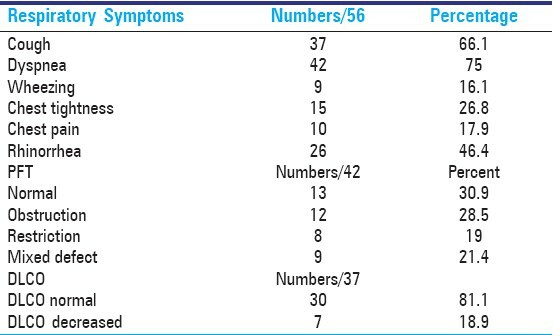 37(66.1%) complained of cough, 42 (75%) had dyspnea, 9 (16.1%) had wheezing, 15 (26.8%) had chest tightness, 10 (17.9%) had chest pain, and 26 (46.4%) had rhinorrhea [Table 2]. However the frequency of reported cough and dyspnea did not corelate with duration of exposure (P>0.05). Since silicosis and its association with mycobacterium infections is known, detailed history regarding tuberculosis was obtained. 2 /56 (3.5%) were on treatment for tuberculosis and 15 (26.8%) had past history of tuberculosis. Of the 15 patients 14 (93.3%) developed tuberculosis after they had started working at the flour mill. Mean hemoglobin concentration was 14.67 gm%, and mean total leukocyte count was 5698.21/mm 3 that was within normal range. 34/56 (60.7%) had abnormal X-ray findings that included nodular shadows (30.4%), lymph node calcification (28.6%), fibrosis (12.5%), hyperinflation (7%). Two patients had progressive massive fibrosis on X-ray [Figure 2]. As per the ILO classification, the profusion and type of small opacities was classified by three independent reviewers. Higher profusion (3/2 and 3/3) and larger opacities (q/r and r/r) were found only in workers with 20 years of exposure or more. 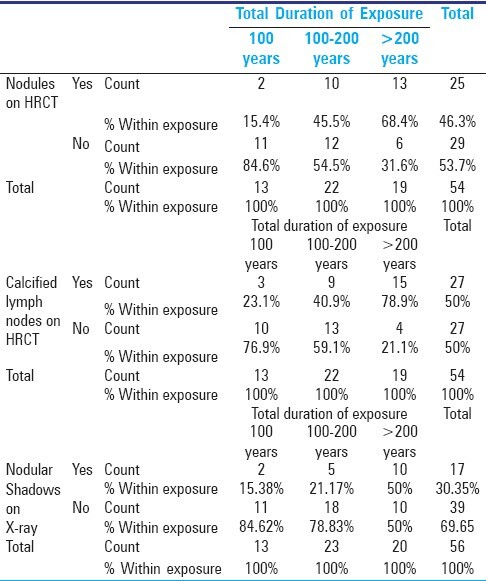 The number of patients showing nodular shadows on X-ray increased with duration of exposure. (P=0.05) [Table 3]. High-resolution CT scan was done in 54 patients. Two patients who had active tuberculosis infection did not undergo HRCT. 44/54 (81.48%) subjects had abnormal HRCT scan findings. The findings on HRCT included calcified lymph nodes (50%), parenchymal nodules (46.3%), fibrotic scarring (44.4%), bronchiectasis (42.6%), pleural thickening (22.2%), emphysema/air trapping (20.3%). As with the chest X-ray, an increasing proportion of patients had nodules on HRCT with increasing duration of exposure with 13/19 (68.4%) of the workers with >200 h-years of total exposure having abnormal scans as compared to 2/13 (15.4%) and 10/22 (45.5%) for workers with <100 and 100-200 h-years of exposure (P=0.01 by Chi-square) [Table 3]. The presence of calcified lymph nodes was the most common finding noted on CT scan and the number showed a statistically significant increase with higher duration of work (P=0.004) [Table 3]. Lung functions were done on 42 / 56 workers. Two workers had tuberculosis; the rest could not perform the maneuver satisfactorily or did not follow up for lung functions. Evaluation of lung functions in the flourmill workers revealed normal functions in 13/42 (30.9%), obstruction in 12 (28.5%) and restriction in 8 (19%), and mixed defects in 9(21.4%). No correlation was found between duration of exposure and lung function abnormalities. DLCO (diffusion lung capacity for carbon monoxide) was determined in 37 subjects. The rest were lost to follow up or were unable to perform the maneuver satisfactorily. DLCO values were normal in 30/37 (81.08%), decreased in 7/37 (18.9%). No significant association was found with decreased DLCO and duration of exposure [Table 2]. In the study, 20 (35.71%) subjects were smokers, 13 (23.21%) were ex-smokers, and 23 (41.07%) were non-smokers. On analysis of smoking status and incidence of respiratory morbidity, it was found that even among the 23 non-smokers 22 (95.7%) had respiratory symptoms, 11(47.8%) had abnormal auscultatory findings, 13 (56.5%) had abnormal HRCT, 12 (52.1%) had abnormal lung functions, and 3 (13.04%) had decreased DLCO. However, a significant relationship between incidences of silicosis was found with smoking history. Only 6/17 (35.29%) of those diagnosed with silicosis were non-smokers while 11 (64.71%) were smokers. 17/56 (30.4%) workers were diagnosed to have silicosis after reviewing the radiological findings. Silicosis is a pneumoconiosis that occurs in three forms depending on the duration and amount of exposure to silica. Although the incidence of silicosis in certain occupations such as mining, silica mills, slate pen workers is well established, risks in the small scale industries rarely come to light. This study highlights this aspect, as flourmills in India commonly use silica-containing grinding stones that require regular chiseling and 30.4% of the 56 workers with exposure of 5 years or more were diagnosed to have silicosis. An indispensable element of silicosis prevention is control at source and use of protective gear. Only 1 of 56 workers surveyed used a cotton cloth to cover his nose, the rest did not use any protection. This highlights the need of creating awareness among workers regarding use of protective gear. Flourmill workers are exposed to flour dust, environmental triggers such as moulds and workplace had poor cross ventilation. Respiratory illness ranging from irritant symptoms to allergic rhinitis and occupational asthma are known to occur in flourmill workers. Persons exposed to grain dust present with productive cough and dyspnea and may also have lower flow rates on lung functions or a positive bronchial challenge. , In our study, 66.1% workers complained of cough, 75% had dyspnea, 16.1% had wheezing, 26.8% had chest tightness, 17.9% had chest pain, and 46.4% had rhinorrhea. In all, 93% of the workers had respiratory symptoms. X-ray showed hyperinflation in 7% workers and HRCT showed emphysema or air trapping in 20.3%. Obstruction on lung functions was noted in 28.5% of surveyed workers. Chronic silicosis occurs usually after 10 or more years of low-grade exposure, however accelerated silicosis can occur after 5 years of exposure to higher concentrations or freshly fragmented silica. , In our study, we included workers with more than 5 years of exposure as regular chiseling leads to exposure to freshly fragmented crystals. 75% had more than 10 years of exposure at workplace and 41.1% working for 10 h/day or more. The incidence of silicosis is known to increase with increased duration of exposure and greater cumulative exposure. Of the 17 subjects (30.4%) in our study diagnosed to have silicosis, only 1 had worked for less than 10 years (8 years) while all the other 16 had worked in a flour mill for > 10 years. The total duration of exposure showed a positive correlation with proportion of workers having abnormal auscultatory findings (P=0.001), presence of nodular shadows on chest radiograph (P=0.05) and HRCT (P=0.01) and lymph node calcification (P=0.004). On X-ray higher profusion opacities were noted only in workers with 20 years of exposure or more. Most common HRCT finding noted were calcified lymph nodes (50%), nodular shadows (46.3%), fibrotic scars (44.4%), and bronchiectasis (42.6%). Other findings noted were progressive massive fibrosis, pleural thickening, air trapping, and emphysema (20.3%). Only 10/54 (18.5%) of the workers screened had a normal HRCT. Previous studies have noted lower FEV 1 and FVC in workers with more than 3 years of work exposure in a bakery/ flourmill when compared with age-matched controls. In our study all the workers included had > 5 years of occupational exposure. 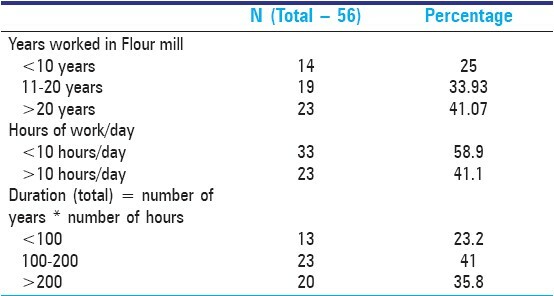 Evaluation of lung functions in the flourmill workers revealed normal functions in 13/42 (30.9%), obstruction in 12 (28.5%), and restriction in 8 (19%), and mixed defects in 9 (21.4%). No correlation was found between duration of exposure and lung function abnormalities. DLCO was decreased in 7/37 (18.9%). In this study, 26.8% had past history of tuberculosis, while two were on treatment for the same at the time of study. Of the 15 patients 14 (93.3%) developed tuberculosis after they had started working at the flourmill thus reinforcing the co-relation between the two conditions. Although smoking is a known confounding factor in development of silicosis and obstructive airway disease due to silica exposure, , this study revealed significant respiratory morbidity even among non-smokers with 95.7% reporting respiratory symptoms, 47.8% with abnormal auscultatory findings, 56.5% with abnormal HRCT, 52.1% with abnormal lung functions, and 13.04% with decreased DLCO. This could be related to the additional exposure to occupational dust including grain flour, moulds, bran that occurs in these workers apart from silica. The incidence of silicosis was higher among smokers. 17/56 (30.4%) were diagnosed to have silicosis. 76% of workers diagnosed to have silicosis were smokers. This prospective study indicates a high incidence of silicosis amongst flour mill workers (30.4%). The incidence of silicosis increases as duration of exposure to silica increases. The respiratory morbidity in flourmill workers is high with 93% having respiratory symptoms. Commonest symptoms reported were cough and dyspnea. Lung functions were abnormal in 69% workers. Obstructive, restrictive, and mixed defects were observed. Most common radiographic findings included calcified lymph nodes and nodular lesions with both showing a higher incidence with greater duration of exposure. 76% flour mill workers who were diagnosed with silicosis were smokers. Importance of health education amongst workers regarding use of protective gear and dust control measures at workplace needs to be emphasized considering the fact that silicosis can only be prevented and not treated. 1. The Global Occupational Health Network: Elimination of silicosis. GOHNET newsletter. Issue no.12-2007. Available from: http://www.who.int/occupational_health. [Last cited on 2011 Aug 3]. 2. Sundaram P, Kamat R, Joshi JM. Flour mill lung: A pneumoconiosis of mixed etiology. Indian J Chest Dis Allied Sci 2002;44:199-201. 3. International Labour Office (ILO). Guidelines for the use of ILO international classification of radiographs of pneumoconioses, Revised edition 2000 (Occupational Safety and Health Series, No. 22). International Labour Office: Geneva; 2002. Available from: http://www.ilo.org/public/libdoc/ilo/2002/102B09_423_engl.pdf. [Last cited on 2011 Aug 3]. 4. Bohdana AB, Massin N, Wild P, Kallop MN, Taomin JP. Respiratory symptoms and airway hyperresponsiveness in apparently healthy workers exposed to flour dust. Eur Respir J 1994;7:1070-6. 5. Ross DJ, Keynes HL, McDonald JC. Sword '96. Surveillance of work-related and occupational disease in the U.K. Occup Med 1997;47:377-81. 6. Office of the Federal Register. 1994 29 CFR 1910.1000. U.S government printing office. Washington DC. 7. Medical surveillance of workers exposed to crystalline silica. American College of occupational and Environmental Medicine. Available from: http://www.acoem.org. [Last cited 2005 Sep 10]. 8. Churchyard GJ, Ehrlich R, teWaterNaude JM, Pemba L, Dekker K, Vermeijs M, et al. Silicosis prevalence and exposure-response relations in South African gold miners. Occup Environ Med 2004;61:811-6. 9. Hughes JM, Weill H, Checkoway H, Jones RN, Henry MM, Heyer NJ, et al. Radiographic Evidence of silicosis risk in the diatomaceous earth industry. Am J Respir Crit Care Med 1998;158:807-14. 10. Hnizdo E, Vallyathan V. Chronic obstructive pulmonary disease due to exposure to silica dust: A review of epidemiological and pathological evidence. Occup Environ Med 2003;60:237-43. 11. Ahmed AH, Bilal IE, Merghani TH. Effects of exposure to flour dust on respiratory symptoms and lung functions of bakery workers: A case control study. Sudanese J Occup Health 2009;4:210-3. 12. Harrisons Principles of Internal Medicine. In: Kasper DL, Braunwald E, Fauci AS, Hauser SL, Longo DL, Jameson JL, editors. 16 th ed., Vol. 2. McGraw Hill Companies Inc.; 2005. p. 1523-5.